The picture above is an underwater Remotely Operated Vehicle (ROV). When I discovered that many people are building similar vehicles for a few hundred dollars, I said – me too! To buy them ready-made, you’re looking at several thousand dollars to start. 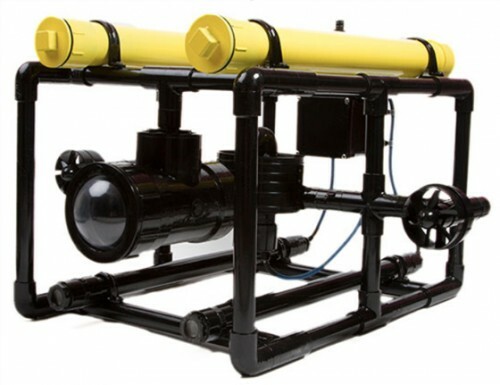 There are a number of videos and websites building your own Underwater Remotely Operated Vehicle (ROV) on the cheap. Most everyone wants a video camera aboard. For me that was the reason for building it. And the GoPro seemed the ideal camera, but there was one more capability I wanted – live video from the ROV’s POV. Since radio waves do not travel well underwater, this meant I’d have to have a hard-wired monitor topsides. The only problem now was that none of the waterproof cases had a wire – whether HDMI or RCA coming through the case in a waterproof manner. The GoPro Hero 3 and 4 had one solution for an extra $200 plus, but those cameras start at $200 so that’s $400 for just the camera. The more I dug into this, the more I realized I’d have to make my own underwater housing. This is not as daunting as you might expect because there are many adventurous souls who have made their own and documented it thoroughly. My search for the right camera for my underwater ROV was not as simple as I expected. I looked into all kinds of approaches like using a board camera and building the whole assembly. I also discovered fish cameras which come complete with cable and topside monitor for as little $130 complete, but I did not find anything I liked with 1080p video. So I looked again at the GoPros, especially the older ones like the GoPro Hero (naked). This would have been fine as it captures 1080p at 30 fps. I could use the GoPro underwater housing and do some surgery on it by adding a sealed hole for the cable that would exit the camera. Since I’m going to have a cable stuck in the camera, I had to consider how much extra space this would require next to the camera connector. Photos and diagrams of the camera were not enough, I’d have to see it in person. So I took a trip to West Marine, a large boating supply house, to see their GoPros. Turned out they only carried the new GoPro Hero 4 which starts at $400 and that was a lot more than I wanted to spend. The camera is only part of the cost, the ROV would need three motors, buoyantly tanks and lots more. I wanted to start with the camera since getting live video from the sea bottom was the whole mission. As I was walking away from The GoPro Hero 4, the salesman asked if I had seen the Garmin Virb Action Camera. Some of the side by side tests showed the Garmin Virb to have better looking video than the GoPros. There are two versions – the Virb and the Virb Elite. The Virb has been discontinued but is still being sold and customers seem to love it. The $300 Virb I saw at West Marine had been marked down to $78! This was my camera. When I got it home I found the battery would not take a charge so I have to exchange it for another one, later today. So my review of that camera will have to wait. And yes I will be putting it at risk by making my own underwater housing, but after reading all the DIY housings I was pretty confident I could make it dry down to 50 feet. I will keep you posted this project on this and will review the camera as soon as possible.